When most people think of shepherd’s pie, they imagine splurging on a calorie-heavy meal in an English pub — with a cold ale, of course. Now you can enjoy the delicious taste guilt-free. And if you need the cold ale, go for a light beer. Preheat the oven to 350°F. Coat a 6- to 8-cup ceramic or glass gratin dish with oil spray. In a large skillet, heat the olive oil over medium-high heat. Add the onion and garlic and cook, stirring, until softened and translucent, 4 to 5 minutes. Add the turkey, and increase the heat to high. Cook, stirring, until the turkey is browned, 3 to 4 minutes longer. Stir in the tomato paste, Worcestershire sauce, garlic powder, thyme, and paprika. Cook, stirring, 2 minutes. Add the broth and cook 2 to 3 minutes, until the turkey is cooked through and a light sauce forms. Season to taste with salt and pepper. Set aside. 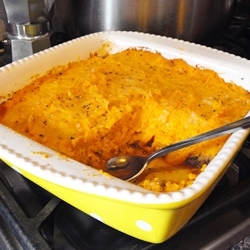 In a large bowl, mash the sweet potatoes with the buttermilk or sour cream until smooth. Season to taste with salt and pepper. In a large metal bowl, beat the egg whites with a pinch of salt on high speed until stiff but not lumpy, 4 to 6 minutes. They should cling firmly to the side of the bowl when tilted. With a spatula, gently fold the egg whites, one-third at a time, into the sweet-potato mixture, until all the egg whites are just incorporated and not deflated. Spread the meat mixture into the prepared casserole dish, and top with the sweet potato mixture. Sprinkle with the Cheddar or Swiss cheese and the Parmesan cheese. Bake, uncovered, until the potato topping is puffed and browned around the edges, 30 to 35 minutes. Serve immediately.